Inscribed on the mount: Genal Sir Chs Hastings Doyle, K.C.M.G./March 23, 1878. This is one of a large collection of original studies for Vanity Fair, which were owned and specially mounted by the first proprietor of the magazine, Thomas Bowles. 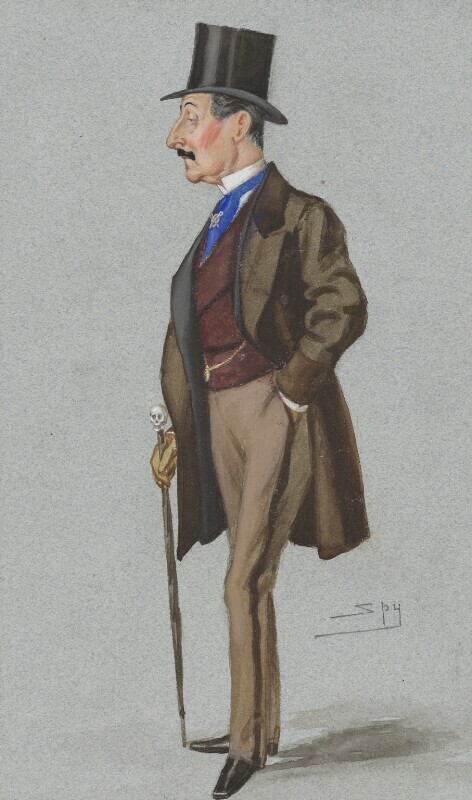 The water-colour of Doyle was published in Vanity Fair as a coloured lithograph, on 23 March 1878, with the title, 'a General'. This is the only recorded portrait of Doyle. Healthy complexion, black hair and moustache. Dressed in a white shirt, blue neck-tie, mauve waistcoat, brown coat, fawn trousers, black top-hat and shoes, holding a rolled umbrella with a handle in the form of a skull. Thomas Bowles; Vanity Fair Sale, Christie's, 6 March 1912 (lot 221); Maggs Brothers, purchased from them, 1934.